Home Basketball	Georgia Increases NCAA Bid Hopes with 68-44 Victory Over Missouri. Georgia Increases NCAA Bid Hopes with 68-44 Victory Over Missouri. 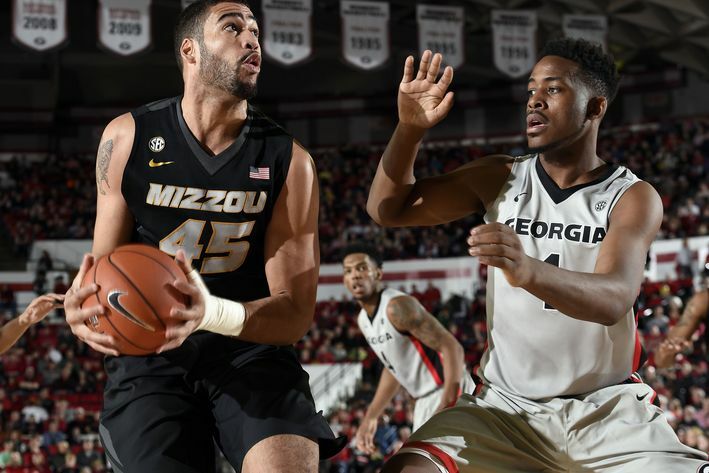 Following a 28-point outburst from Namon Wright in the game against Florida the Missouri Tigers found themselves back in the loss column after being manhandled on the road at Georgia 68-44. Johnathan Williams III and Wright each led the Tigers with 10 points apiece, but did so on a disappointing 6-21 from the field. As a team Missouri only connected on 28.6 percent of its shots and only shot 57 percent from the charity stripe. A healthy Georgia sought just its third NCAA tournament birth in the past 13 years. The Bulldogs played a physical and sound game on both sides of the ball after dropping its last two home contests. Nemanja Djurisic’s game high 14 points propelled the Bulldogs to victory. The Tigers looked like they might get a two-game winning streak going as Wright connected on a three-pointer right out of the gate to give the Tigers their only lead of the game 3-2. Though as has been the case Missouri went on to miss its next eight shots. Georgia performed well defensively by locking down Missouri’s leading scorer Williams III, who had a mere four points in the first half. Williams III has struggled shooting the ball recently as he’s only shot over 40 percent from the field once the past six games. Missouri’s spotty shooting allowed the Bulldogs to build a comfortable lead and at the half Georgia led 41-23. The Tigers never really made a comeback in the second half as Cameron Forte and J.J. Frazier applied the pressure off the Bulldogs bench to increase Georgia’s lead. The pair each tallied 10 points on the afternoon en route to Georgia’s third straight victory. The Bulldogs needed this win after losing their last two home contests and they were able to get the job done. Mark Fox has to be pleased with the way his team came out firing even against a struggling Missouri squad. The game represents a nice tune up ahead of the team’s next contest when they play host to top ranked Kentucky on Tuesday, March 3. On the Tigers side of the ball it was another forgettable chapter in what has been a long season for Kim Anderson. The team continues to struggle shooting the ball, which is the primary problem. In the offseason shot development and fundamentals will continue to be the primary focus as they look to rebound and build a solid foundation in Columbia. Up next for the Tigers is Auburn as they will travel back home to Columbia to take on the Tigers on senior night on Tuesday, March 3.